Directed by Danny Boyle. Starring James Franco, Kate Mara, Amber Tamblyn. For some reason I keep on comparing this film to “Buried”: the concept and the scope of both films is pretty much the same. One person stuck in a confined place for the whole length of the film. 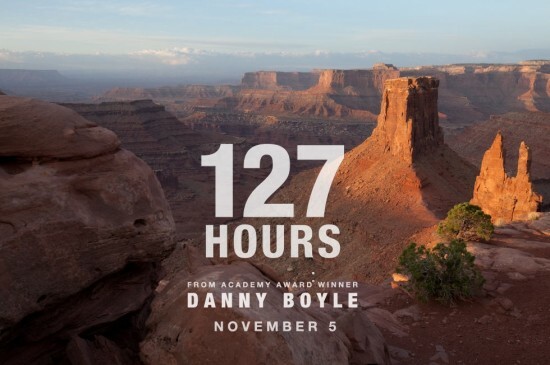 But while in “Buried” the director was able to keep the entire film inside the box and never “cheated” by giving the audience flashbacks or shots of whatever was happening in the outside world, here in “127 Hours” director Danny Boyle uses every trick in the book to make the visual more exciting and sometimes to the expense of the emotional response that one should have for a story of this kind. Split screens, speeded up/trippy sequences, long zooms out from a tiny close up of James Franco’s face to the widest view of the Canyon. Surely it makes it all exciting to watch, yes the photography is beautiful (2 different Directors of Photography were used for this film. And by the way that first bicycle riding sequence is really breath-taking), yes the editing is as flashy as it can be (in fact I think it’s easier to produce showy editing of this kinds than proper invisible one… But then again, wait and see how this one will win the Oscar), but when it comes to getting really close to our main character, knowing his history, his background, his life, that’s when the film fails for me. Listening to a Q&A sessions with the makers at the end of the film, I was actually intrigued to hear about the real story and I started longing for a documentary about it… Hold on a second… Would I need a documentary if the film had satisfied me completely? It’s really not James Franco’s fault! He gives the performance of his career and I can easily see an Oscar nomination coming his way, the problem is that Boyle is so preoccupied about whizzes and bangs, about his visual flashy style and about making you feel so trapped like the main character has, that he forgets what the story (and the original book) was really be about: a cathartic experience about a man who’s accepted his own death and looks back at his life realising all the mistakes he’s done. In the end it just becomes a story about the power of self-preservation. It’s absolutely not a bad film, but this one could have been so much deeper and fuller, at least to match the fullness of the visuals (and its soundtrack too, I should add, as always in a Boyle’s film, was very accomplished). People will love, I’m sure about that, but I really wanted a masterpiece out of this one, like the trailer made it look like. At the end of the day, the style of the film won over the actual substance e reduced it to just a good one, but not a great one.